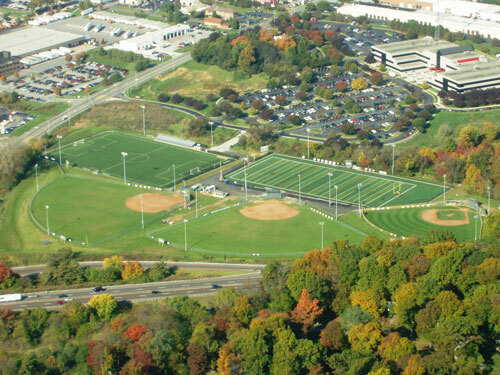 The West Chester Area Sports Association, West Chester United Soccer, West Chester Lacrosse and Little All-American Football Association teamed up to renovate the natural grass soccer and football/lacrosse playing surfaces to state of the art, all-weather synthetic turf playing surfaces. The upgrade to these facilities allows us to provide an even safer, year round playing surface for our players. Additionally, the installation of these fields helps us better utilize natural resources and lower our field maintenance costs by providing an environmentally free playing surface that also improves storm water management and eliminates the need for fertilizers and pesticides that commonly are required to maintain natural grass playing fields. The new fields will also be more available for additional community sporting events adding value to our local area organizations. The above recent aerial photo shows our new regulation turf soccer field (top left), new 100 yard turf football field (top right), two 300' fenced softball fields (bottom left and middle) and Little League baseball field (bottom right). Many thanks to Al Kelly of Kelly Sports for his generous donation and continued support of Chester County athletics.